The Chain Pier and Marine Parade, Brighton (c. 1830).Drawn and engraved by John Bruce. The Chain Pier, Britain's first seaside pleasure pier, was opened on 25th November 1823. Photographic Institution was situated at No 57, to the left of the first pier tower. *desideratum = a thing wanted or desired"
Neither the article or the advertisement in the Brighton Guardian of 10 November 1841 mentions the name of The Proprietor of the Photographic Institution. The anonymous proprietor was William Constable, a multi-talented man, who at the age of 58 was entering a new field of enterprise, which would draw upon those inventive skills which he had previously demonstrated in the world of science, art and business. In the 1851 Census, William Constable gave his occupation as Flour Manufacturer and Heliographic Artist, but this description fails to reflect what had up to then been an extraordinary and colourful career. A man without the benefit of an extended formal education, William Constable had worked at various times as a successful high street draper, an inventor of scientific devices, a watercolour artist, cartographer, land surveyor, architect , bridge builder, engineer, and the surveyor of a thirty mile stretch of the London to Brighton Turnpike Road. [SOURCE 2] At an age when most men would be entering the last stage of their working life, William Constable decided to embrace a new technology and embark on a new career as a Photographic Artist. During his lifetime, William Constable made a total of three visits to America and it is possible that on his last trip to the States in 1840, he had the opportunity to study the commercial possibilities of the recently invented art of photography. Louis Jacques Mande Daguerre, a French theatrical designer and showman had perfected the technique of fixing an image on a silver-coated copper plate in the late 1830s and the process had been announced to the world in Paris in August 1839. This early form of photograph was given the name daguerreotype by its inventor. The first successful American daguerreotype was made in New York in September 1839 . Alexander Wolcott and his business partner John Johnson opened the worlds first daguerrian portrait studio in New York at the beginning of March 1840. Given Constables intellectual curiosity and his fascination with scientific processes, it is likely that he took an early interest in the new art of photography and while in America he had the opportunity to observe the work of early American daguerreotypists and see the commercial potential of producing and selling photographic portraits. It is therefore possible that when William Constable returned to Brighton from America in 1841, he already had some knowledge of the daguerreotype process. However, in the England of 1841 he was not free to open his own independent photographic portrait studio. In England, unlike other parts of the world, any person who wished to establish a daguerreotype portrait studio first had to acquire patent rights or purchase a licence from Richard Beard, a prosperous businessman who since 1840 had taken steps to take control of this new commercial enterprise. Richard Beard opened England's first photographic portrait studio in London on 23rd March 1841 and made a fortune selling daguerreotype licences. Richard Beard, a successful coal merchant, and patent speculator, had seen the advantages of securing a monopoly in the production of daguerreotype portraits in England. In June 1840, Beard filed a patent which included the features of Alexander S Wolcotts mirror camera which, by drastically reducing exposure times, would make the production of photographic portraits more effective. Beard then employed the services of John Frederick Goddard, a chemist and lecturer in science who had been experimenting with various chemicals to sensitize the silvered plates in an effort to accelerate camera exposure times. Early in 1841, Goddard produced a mixture of iodine and bromine to increase the sensitivity of the photographic plates, thereby reducing exposure times to less than a minute or, in bright sunlight, to a number of seconds. On 23rd March 1841, Richard Beard opened Englands first photographic portrait studio to the public at the Royal Polytechnic Institution, 309 Regent Street, London. In June 1841, Beard concluded his negotiations with Miles Berry, Louis Daguerres patent agent in England, and purchased the patent rights to the daguerreotype process. On 16th July 1841 Beard signed an agreement with Daguerre and the son of Nicephore Niepce, the man who had made the first successful photograph from nature in 1826. By the end of July 1841, Beard had become the sole patentee of the daguerreotype process in England, Wales and the town of Berwick on Tweed, and in all Her Majestys Colonies and Plantations abroad and had a virtual monopoly in the production of photographic portraits using Daguerres method. Beards only serious rival in the field of daguerreotype portraiture in 1841 was Antoine Claudet, a French glass merchant living in London,who had made direct contact with Daguerre in France and had secured from the inventor a licence to make daguerreotype portraits in London. Until the patent rights of British Patent No 8194 expired on 14th August 1853, any person who wanted to legally carry out the art of daguerreotype portrait photography on a commercial basis had to apply to Richard Beard, to either purchase the right of patent in a prescribed geographical area or to purchase a licence to work the process in a particular town or city. 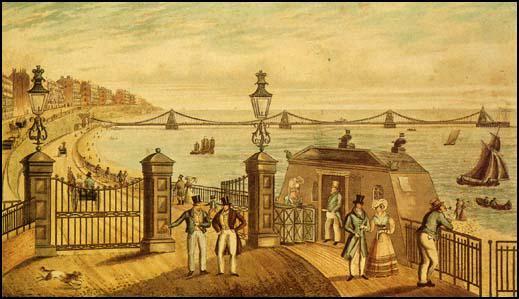 In June 1841, Richard Beard claimed to have disposed of licences for Liverpool, Brighton, Bristol, Bath, Cheltenham and Plymouth. The first provincial photographic studio in England was opened on 31st July 1841 at Plymouth. A second daguerreotype studio was opened in Bristol on 10th August 1841. In September, 1841 Photographic Institutions were established at Cheltenham and Liverpool. On Saturday 2nd October, Alfred Barber opened a photographic portrait studio in Nottingham. The proprietors of these new Photographic Institutions required considerable capital. To operate in the town of Nottingham, Alfred Barber was expected to pay a total of £1,220, made up of a down payment of £450, a first instalment of £50, followed by three separate quarterly instalments of £240. The Licence which covered Liverpool and a ten mile area around the city was fixed at £2,500. 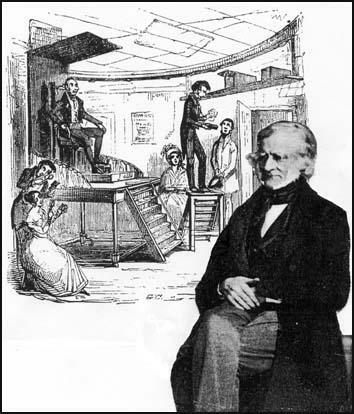 William Constable seated in front of Cruikshank's 1842 picture of an early daguerreotype studio. Constables phrase the lateness of the season could be assumed to be a reference to the darkening skies of winter, when an absence of sunshine would lengthen camera exposure times and affect the quality of his studio portraits, but he was probably expressing his concern that the season of the year when it was fashionable to visit Brighton was nearing its end. Twenty years earlier the aristocracy and the upper classes of society had traditionally visited Brighton in the summer months of June, July and August. The Brighton Ambulator of 1818 had calculated there were 7000 additional residents in Brighton during the summer months between June and October, but from November to February the number of visitors declined to 2,300. 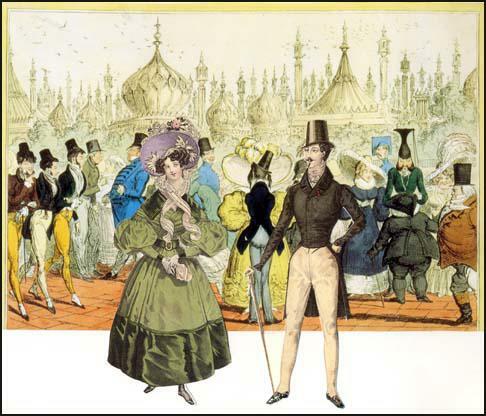 By 1830, the fashionable season had shifted from the summer to the autumn and winter.
. A fashionable couple with Alfred Crowquill's Beauties of Brighton (1826) in the background. the summer months are abandoned to the trading population of London, the early autumn is surrendered to the lawyers and when November summons them to Westminster, the beau monde commence their migration to encounter the gales of that inclement season secure from any participation of the pleasure with a plebian multitude. Constable had established his exclusive portrait studio in Brighton at a time when the nobility and gentry were delaying their visits to Brighton, restricting their period of stay at this fashionable seaside resort to the months of November, December and January. As Edmund M Gilbert commented in his study of Brighton and the growth of the English seaside resort, the aristocracy found that residence in Brighton could be deferred until after the departure of the vulgarians. 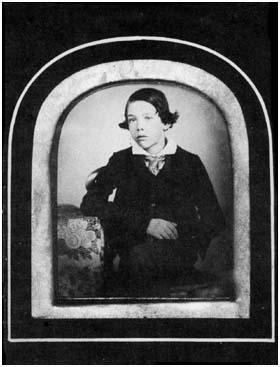 Copy of a daguerreotype portrait of Prince Albert  Attributed to William Constable's Photographic Institution. John Counsell, one of Constable's assistants, claimed to have operated the camera when Prince Albert sat for his portrait in Brighton on 7th March, 1842. The Royal Family chose to visit Brighton even later in the season, perhaps to avoid the fashionable visitors. Queen Victoria, her consort Prince Albert, their two young children, Victoria the Princess Royal and Albert Edward, the Prince of Wales and members of Court took up residence at the Royal Pavilion on 10th February 1842. On 25th February, George Anson, Prince Alberts Private Secretary, visited Constables Photographic Institution on Marine Parade and had his portrait taken. Just over a week later, on 5th March 1842, Prince Albert himself, together with two German cousins, arrived at Constables studio unannounced hoping to have their portraits taken but, as Constables sister Mrs Susanna Grece later recalled, the day was an "unlucky one for portrait taking" and the Prince and his cousins like others this day could not get a good picture. The next day, Prince Alberts German relatives Prince Ferdinand of Saxe-Coburg and his two sons Prince Augustus and Prince Leopold sat for their portraits and as later reported in the Sussex Express expressed their astonishment at the rapidity of the process and the fidelity of the likenesses. Encouraged by their response, Prince Albert called in at the Photographic Institution on the afternoon of 7th March in order to be photographed. According to the journal of Constables sister, Susanna Grece, Prince Albert posed a number of times that afternoon, but with limited success. He had eight pictures, not all good. The successful daguerreotypes were later photographed and two carbon prints have survived. These two small portraits of Prince Albert, dated 1842 and attributed to Constable, are believed to be the earliest surviving photographs of a member of the Royal Family. The royal visit would have helped to establish William Constables reputation as a photographer to the aristocracy and members of the Court. Over the next ten years his sitters included the Duke of Devonshire, the Marchioness of Donegal, Lord Cavendish and the Grand Duchess of Parma. As Constable noted in 1848 I have had many sitters from the ranks that are called noble. 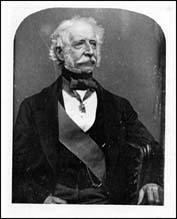 A daguerreotype portrait of Sir Hugh Gough taken in 1850 by an unknown photographer. Born in 1779, Gough fought with Wellington in the Napoleonic Wars. A portrait miniature of a young officer by the artist George Engleheart [1750-1829]. When Sir Hugh Gough ( far left ) was an officer in Wellington's Army in the early part of the 19th Century, a visit to a portrait painter was the only way to secure a good likeness. By the time he was in his early sixties, Gough, like other wealthy men, could turn to a daguerreotype artist to make a small photographic portrait. Constable had been fortunate to secure Royal patronage and his aristocratic and noble clients saw him safely through his first two years of business at Marine Parade. However, Constable was an astute businessman and was prepared to take steps to ensure a steady flow of sitters. When Constable opened his Photographic Institution in November 1841, he charged one guinea (£1.1s or 1.05p) for a portrait in a plain morocco leather case. His prices are comparable to those charged by other Beard Licencees of the period. Prices in the West End of London were rather higher. Beard's own Polytechnic Studio in Regent Street London charged upwards from £1 8s 6d (about £1.42p) for a small daguerreotype portrait. Running a Photographic Institution in the 1840s could be lucrative, but it was a risky business. Within two months of opening to the public in September 1841, the Liverpool studio had taken 500 portraits. However, in Nottingham, Alfred Barber had taken only 53 portraits over a four month period and when he failed to keep up his quarterly payments, Beard took legal action to close Barber's studio. Constable feared that the prices he charged his exclusive clientele would deter other potential customers. By the end of 1843, he had reduced his price for a cased portrait from £1.1s (£1.05p) to 12s 6d (62p), hoping "to possess himself of the patronage of the middle classes of the community." A daguerreotype portrait was still out of the reach of ordinary working people. An unskilled worker would earn less than 10 shillings (50p.) a week in the 1840s. However, reducing the price of his daguerreotype portraits meant that his customer base was widened to embrace wealthy visitors and Brighton's expanding middle class. The Dukes, Earls, Lords and Ladies who made up Constable's early clientele were joined by prosperous merchants, successful businessmen and professional gentlemen together with their wives and children.The addition of customers drawn from the middle ranks of society ensured that Constable had no shortage of sitters in the late 1840s. William Constable is known to have employed operators at his Photographic Institution on Marine Parade from the very beginning.Constable's sister, Mrs Susanna Grece, mentions in her journal that her brother employed at least two assistants in 1842. John Counsell, who later became a daguerreotypist in Edinburgh and Cornwall, claimed to have made the portraits of Prince Albert and the Duke of Saxe Coburg at Constable's Marine Parade studio in March 1842. The photographic artist James Thomas Foard, who went on to manage Beard's Liverpool studio in 1849, had worked for William Constable five years earlier. Very few of the original proprietors of the provincial Photographic Institutions licensed by Beard stayed in business for very long. The Photographic Rooms in the Horticultural Gardens of Bristol changed hands at least 3 times between 1841 and 1848. 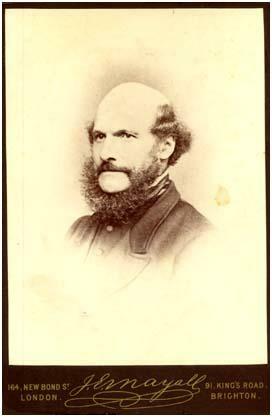 John Palmer, an early Beard licensee, vacated the Cheltenham Photographic Institution in 1844 after only 3 years. In contrast, William Constable remained in business as a Photographic Artist in Brighton for 20 years from November 1841 until his death in December 1861. Holding an exclusive licence from Richard Beard, William Constable had a virtual monopoly in the production of photographic portraits in Brighton between November 1841 and 1851. In the Census of 1851, the only other photographer recorded in Brighton was nineteen year old Thomas B.Leffin, who was presumably an assistant to William Constable. The 1851 Census describes Constable as "Flour Manufacturer and Heliographic Artist ", a widower aged 67, living with two nieces, Caroline and Eliza Constable, who probably provided assistance in his photographic business. After William Constable died in December 1861, a Miss Constable continued to run his studio at 58 King's Road. After Beard's Daguerreotype Patent expired in August 1853, a number of Brighton trades people, who had already shown an interest in the art of photography, set up their own daguerreotype portrait studios.As early as 1852, William Lane, proprietor of 'Lane's Cheap Picture Frame Manufactory', established a Photographic Depot at 3 Market Street, Brighton where he supplied "Daguerreotype Lenses, Camera Apparatus" and "every other requisite used in Photography." A complete set of apparatus for the daguerreotype process cost 7 guineas at Lanes' Depot.In an advertisement which appeared eight days before Beard's daguerreotype patent was due to expire, William Lane was offering to supply 'Daguerreotype Apparatus' to operators and amateurs promising free instruction in the Photographer's Art to purchasers of materials. By November 1853, Lane had set himself up as a photographic artist and was offering to provide "a first class daguerreotype portrait in handsome French case for two shillings" at his new premises at 213 Western Road. Robert Farmer, who had taken over William Passmore's Chemist's shop at 59 North Street in 1852, transformed part of his new business premises into Daguerreotype Rooms - which included "a room designed and built expressly with apparatus of very superior construction for the purpose . . . to ensure a fine portrait." 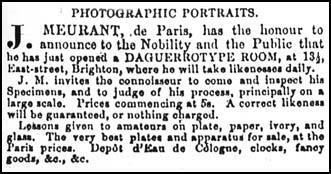 In newspapers issued in November 1853, Robert Farmer publicized his Daguerreotype Rooms and "invited the attention of the Ladies, Gentlemen and Visitors to Brighton to his collection of Photographic Portraits, taken plain or in colours, by competent Artists". Mr Farmer offered to take "fine portraits" at moderate prices - "1s 6d in case; or coloured 2s 6d" which would have been considerably lower than those charged by William Constable's Original Photographic Institution in Marine Parade. In 1839, the same year that Daguerre announced his method of fixing images on a silvered copper plate, William Henry Fox Talbot, an English landowner, scholar and scientist published 'The Art of Photogenic Drawing', an account of how he had managed to capture images permanently on paper. Four years earlier, Talbot had produced tiny photographic views of Lacock Abbey, his home in Wiltshire. By treating the small pictures with wax, Talbot was able to use them as negatives and print further copies. Although he had invented a negative/positive photographic process, Talbot's early pictures were small, required very long exposure times and lacked the sharpness of detail and brilliance of the daguerreotype. Talbot continued his experiments and improved the quality of his photographs by coating his paper with silver iodide and developing the images with a gallo-nitrate of silver solution. Talbot patented his new process in February 1841, describing his pictures as 'Calotypes'. Talbot protected his photographic inventions by filing a number of all-embracing patents. Under pressure from the Royal Academy and the Royal Society, Talbot had, in August 1852, relaxed his control over the production of calotypes, allowing amateurs and artists to use the process, but he insisted that all professional photographers who wanted to use his calotype process for taking portraits had to purchase a licence, which usually involved an annual fee of between £100 and £150. In 1852, Thomas Henry Hennah, a young London artist, together with William Henry Kent, a photographic artist from the Isle of Wight, purchased a licence from William Fox Talbot to make portraits using the calotype process. The photographic prints were called 'Talbotypes' in honour of the inventor. By 1854, Hennah and Kent had established a Talbotype Portrait Gallery in William Henry Mason's Repository of Arts at 108 King's Road, Brighton.An item in the 'Brighton Gazette' of 12th October 1854 indicates that the Talbotype Gallery specialised in taking portraits of the nobility and the upper ranks of society. The 'Brighton Gazette' enumerates "a few of the distinguished persons who have recently honoured these eminently skilful artists with a sitting", listing the Duke of Devonshire, Countess Granville, Lord Carnworth, Lady Keats and several other notable visitors to Brighton. 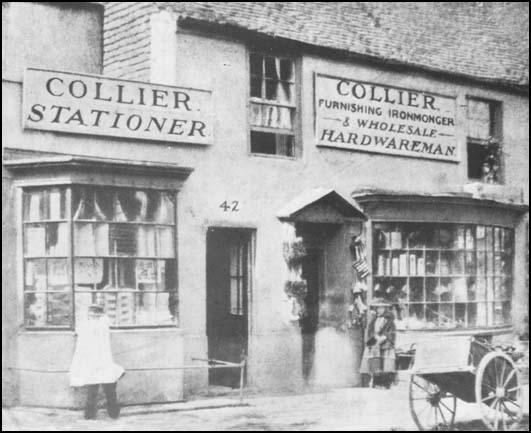 Hennah & Kent came into direct competition with William Constable who in July 1854 joined forces with another daguerreotype artist, Edward Collier at 58 Kings Road to form the firm of Constable & Collier. 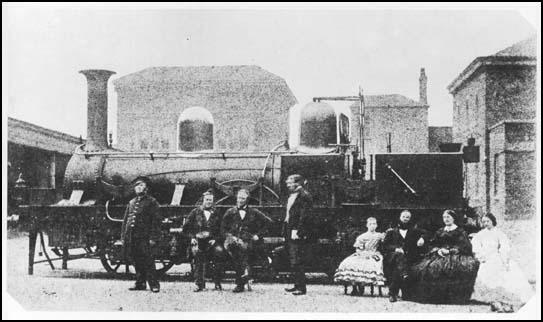 Craven's Locomotive No12 with John Chester Craven,his family and staff at Lover's Walk,Brighton (May 1858) A talbotype had less detail than a daguerreotype and the print often had a fuzzy and mottled appearance. Stephen Grey and William Hall, who established their General Photographic Institution at 13 St James Street in the summer of 1854, offered to take portraits "by all the most recent and improved processes by 'Licence of the Patentees'. Large sized Talbotype portraits mounted in a gilt frame were offered at 15 shillings (75p), while daguerreotype portraits were priced from 6 shillings (30p). Amateurs and artists who wished to use Talbot's invention could turn to Lewis Dixey, optician and mathematical instrument maker of 21 Kings Road, Brighton, who supplied "every description of photographic apparatus for the Calotype" and iodized paper for the Talbotype. Frederick Scott Archer's collodion 'wet plate' process produced a glass negative which could make an unlimited number of prints on paper. However, most customers were seeking a cheap alternative to the handsome daguerreotype portrait, which came protected under glass in a metal frame and presented in a velvet-lined, leather-bound display case. Scott Archer soon realised that by underexposing the collodion glass negative and placing it on a black background, the image took on the appearance of a positive picture.The resulting image was as sharp and clear as a daguerreotype, yet Archer's new process was cheaper and less complicated. Furthermore, the collodion positive process was incredibly quick to perform. Photographers could see immediately the commercial possibilities of a cheap and speedy method of taking portraits. The "collodion positive" photograph on glass could be backed with black paper, very dark varnish or provided with a background of black velvet or similar dark cloth. Protected by glass, placed in a metal frame and inserted in a presentation case or an elaborate frame, the collodion positive was an inexpensive substitute for the daguerreotype portrait, which in the 1840s had been the preserve of the nobility and the wealthy middle classes of society. A Portrait of a Bearded Man. A collodion positive photograph on glass taken by George Ruff senior (c1858). The presentation case is similar to the ones that held daguerreotype portraits. William Lane of Brighton was promoting the new process of making "portraits and views taken on glass" as early as September 1852. In an advertisement placed in The Times, dated 10th September 1852, Lane claimed that "any person can produce in a few seconds, at a trifling expense, truly life-like portraits. "Early in 1853, William Lane's Cheap Photographic Depot was offering a "complete set of apparatus for the glass or paper process" for the sum of 4 guineas (£4. 4s/£4.20p). By October 1853, The Royal Chain Pier Photographic Rooms in Brighton were advertising "Portraits superior to engravings by the new process on glass." On 3rd August 1854, Grey & Hall's Photographic Institution on St James Street announced they had "completed arrangements for taking portraits by all the most recent and improved processes, by License of the Patentees". In addition to Talbotype portraits and "Daguerreotypes warranted to last," Grey and Hall offered to make "Coloured Collodion Positives by a new and peculiar process" for the sum of 15 shillings (75p). Stephen Grey and William Hall were keen to emphasize that their new methods of taking portraits were "licensed by the Patentees". Archer had not patented his invention and Beard's daguerreotype patent had expired the year before, but William Henry Fox Talbot claimed that the "collodion process" was covered by his earlier patent which had described a negative/positive system of photography. In 1854, W.H.Fox Talbot took legal action against the studio of Silvester Laroche,the professional name of Martin Laroche, a London photographer who had started to use Archer's "wet collodion" technique in 1853. Silvester Laroche went to court to defend his right to use the "wet plate" process. In December 1854, Laroche was found not guilty of infringing Talbot's patent rights and as a result of this legal judgement all photography was now free from restriction. In the summer of 1855, James Henderson, a photographic artist who had previously operated portrait studios in London's Strand and Regent Street, opened a photographic studio at No 5, Colonnade in New Road, Brighton. In an advertisement dated 4th August 1855, James Henderson offered to take "Photographic Portraits, on Paper, Silver, and Glass Plates . . . Prices from 10s 6d and upwards." In this newspaper advertisement, Henderson "begs to remind all lovers of Photography that he has been at considerable expense in defending the freedom of this beautiful art against Mr Fox Talbot, the Patentee of the Talbotype process." Earlier, in May 1854, Talbot had obtained an injunction which restrained Henderson from making and selling photographic portraits by the collodion process. Laroche's successful defence against Talbot's legal action meant that Henderson and other photographers in Brighton were free to produce portraits using any of the main photographic processes. The earliest photographer in Brighton, William Constable had, before turning to photography, received some attention for his artistic talent in drawing and painting. During his travels in America, Constable made sketches of Niagara Falls and other striking features of the New World, which he later made into finished watercolours. A contemporary newspaper The Brightron Herald described Constable's artwork as "eminently fresh, graphic and original". Modern commentators on Constable's photographs draw particular attention to their artistic quality. Many of Brighton's early photographers had an artistic background. 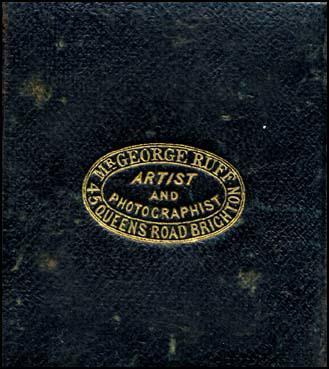 George Ruff gave his occupation as "Painter in Oil and Water Colours" in the 1851 Census and as an artist, exhibited marine and landscape paintings before he set up his photographic studio in Brighton's Queens Road. Edward Fox junior was described as a "decorative painter" in the census and Jesse Harris, who was describedl as a daguerreotype artist in 1854, is recorded in the 1851 Census as "Artist-Painter". Stephen Grey, who joined with William Hall to form the photographic firm of Grey & Hall in 1854, is listed as a portrait painter in an 1852 directory. 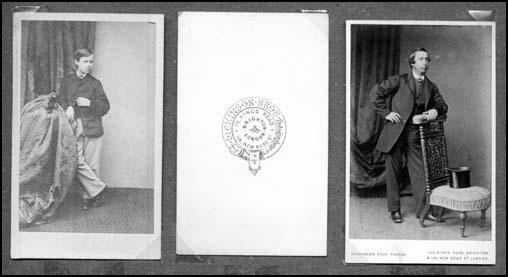 Thomas H. Hennah, a partner in the Hennah & Kent photographic studio, gave his profession as "artist" to the census enumerator. Photography has its technical as well as artistic aspects. The early photographic processes were complicated and required the agency of chemicals and so it is not surprising that an early Brighton photographer was the chemist Robert Farmer, who had come to Brighton in 1852 to take over William S. Passmore's chemist's shop at 59 North Street. Photography also involves optics and the employment of lenses and so Lewis Dixey, optician and mathematical instrument maker of Kings Road, Brighton was well placed to provide photographic apparatus and by 1854 he was also listed as a daguerreotype artist. It was perhaps natural for carvers, gilders and picture frame makers to become involved in the new art of photography. William G. Smith who became a photographic artist in the mid 1850s was a carver and gilder residing in Western Road Brighton at the time of the 1851 Census. William Lane had owned the 'Cheap Picture Frame Manufactory' at 3 Market Street, near Castle Square, Brighton, where he mounted and framed paintings, engravings and water colour drawings. As early as 1852, Lane had added to his picture framing business a Photographic Apparatus Depot. William Lane described himself as a photographer in 1852, but he had few artistic pretensions. He took a more practical approach than photographic artists such as Constable, Fox, Harris, Hennah and Ruff. According to William Lane's 1852 advertisement, artistic talent was not a prerequisite for accomplished photography. "No knowledge of drawing required to produce these wondrous works of art and beauty... By this new process any person can produce in a few seconds (at a trifling expense) truly life-like portraits of their friends, landscapes, views, buildings etc". Lane offered to provide "printed instructions, containing full particulars for practising this fascinating art with ease and certainty". William Lane was happy to supply daguerreotype apparatus and materials to operators or amateurs, providing "instructions in the Photographic Art" free of charge to all purchasers of photographic equipment. By the late 1850s, tradesmen with no previous interest in art or photography had set themselves up as photographic artists. Possibly armed with apparatus and instructions from Wiliam Lane's Photographic Depot or some other local supplier, two brothers Charles and John Combes, established themselves as "daguerreotypers" at 62 St James Street, Brighton in 1854. In 1851, Charles Combes was employed as a warehouseman and his younger brother John was learning shoemaking from his cordwainer father. The Combes brothers obviously believed they could improve their fortunes by entering a potentially lucrative business. James Waggett, was earning a living manufacturing and tuning pianofortes, when he decided to offer the additional service of taking photographic portraits. After 3 years or so, James Waggett was removed from the list of Brighton photographic artists and appeared once more under the heading 'pianoforte tuners' in the local trades directory. The chosen trade of James R Bates was that of fruiterer and seedsman. As a 23 year old, he was running a fruiterer's shop in Brighton and forty years later he was still in the same business. Yet, for at least a year from 1858 to 1859, James R Bates tried his hand at photography. When the expected profits did not materialise, Bates abandoned photography and returned to selling fruit, seeds and flowers. Joseph Langridge was a true entrepreneur. Langridge was prepared to invest in any sort of scheme and ready to carry out any trade to make money, and he eventually realised that taking photographic portraits was as good a way as any. In his twenties, Joseph Langridge, the son of a pawnbroker and second hand clothes dealer, borrowed heavily to purchase railway shares, and invest in a jewellery business. He carried on as a jeweller in Brighton until the late 1840s when he started a bakery business in London. Langridge was an insolvent debtor in 1842 and nine years later, after his bakery venture failed, he was again declared insolvent and sentenced to 10 months imprisonment for not paying off his debts. On his release from prison, Langridge tried his hand at manufacturing soda water and, by 1853, he was selling smoked and salted herrings as 'Brighton bloaters'. Listed as a photographer at 43 Clarence Square Brighton in 1858, Joseph Langridge was probably the man behind the photographic firm of Merrick & Co, which appeared at 186 Western Road in 1856. Under the studio name of Merrick, Joseph Langridge continued as a photographic artist in Brighton for another sixteen years. Mrs Agnes Ruge has the distinction of being the first woman to be recorded as a photographer in Brighton. Madame Ruge is listed at 180 Western Road under the heading of Daguerreotype Artists in W J Taylor's 1854 Directory of Brighton. Agnes Ruge, who was born in Dresden, Saxony, arrived in England in 1850 and was one of several emigres who practised photography in Brighton. Joseph Meurant, who was originally from Paris, had opened a Daguerreotype Room In East Street, Brighton in July 1852. 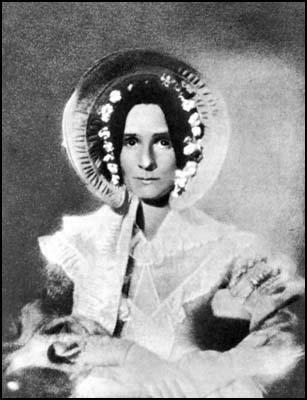 Agnes Ruge was the wife of Professor Arnold Ruge (1802-1880), an associate of Karl Marx and a radical, who had been driven into political exile after the failure of the 1848 Revolution in Germany.Mrs Ruge worked as a daguerreotype artist for only a short period of time. By 1857, Agnes Ruge was earning a living as a teacher of the German language. Karl Marx wrote in November 1857 that "Mrs Ruge is the only teacher of German in Brighton" and added that "so greatly does demand exceed supply," she had to recruit her 19 year old daughter,Hedwig, as an assistant. In 1851, Sarah Lowenthal was described as a "Preceptress", or teacher, at a Ladies' School in Brighton. Mrs Lowenthal was the English wife of Nathan Lowenthal, a Prussian immigrant , who, in the 1851 Census, gave his occupation as "Professor of Languages." In 1856, Mrs Sarah Lowenthal is listed in a local directory as a "Talbotype Portrait Colourer" based at Lonsdale House, College Road, Brighton. 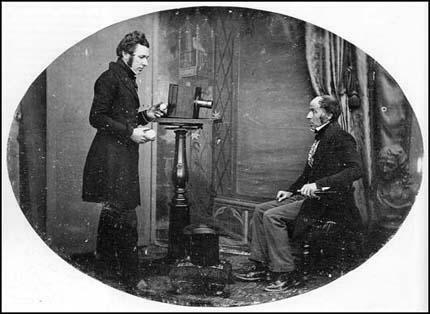 In the ten years between November 1841 and November 1851, William Constable, aided by a few assistants, was the only photographic artist operating a portrait studio in Brighton. All the photographers listed in Taylor's 1854 directory appeared under the heading 'ARTISTS - Daguerreotype', yet we know Hennah & Kent specialised in talbotypes, Lewis Dixey stocked photographic apparatus for the calotype and collodion processes, Farmer produced calotypes using a waxed paper process and Grey & Hall employed "three distinct processes" - talbotype and collodion as well as daguerreotype. To the 10 studios listed by Taylor's Directory in 1854 we can add the names of the artists Edward Fox junior and George Ruff, both of whom were using a camera to make views of Brighton in the early 1850s. William Constable, who for 10 years had enjoyed a monopoly in the production of photographic portraits, was now faced with up to a dozen competitors. In the summer of 1854, Constable closed his original studio at 57 Marine Parade and removed his photographic business to the Old Custom House at 58 King's Road, where he joined forces with the daguerreotype artist Edward Collier. The Partnership of Constable & Collier continued for about 3 years. By 1858, William Constable was listed as the sole proprietor of the Original Photographic Institution at 58 Kings' Road. In June 1855, the Brighton and Sussex Photographic Society was formed. The Photographic Society held monthly meetings and was open to amateurs and professionals. An amateur, the Reverend Watson acted as chairman, while the post of Honorary Secretary was held by Constable's business partner and professional daguerreotype artist Edward Collier. By September 1855, the Photographic Society boasted 40 members. James Henderson, a well known London daguerreotype artist, arrived in Brighton in the summer of 1855, but by September he had moved on to Cornwall, to establish a portrait studio in Launceston. Henderson may have been deterred by the number of photographers already active in Brighton. Folthorp's Brighton Directory, which had been corrected to September 1856, adds three more photographic studios not listed in Taylor's earlier directory. George Ruff, who had been taking daguerreotype since around 1850, finally presented himself as a professional photograher in 1856. Also listed in 1856 was the firm of Merrick & Co and James Waggett, who had previously operated as a manufacturer and tuner of pianofortes at 193 Western Road. Photographic artists were listed in the section on Professions and Trades in Brighton directories, but these listings do not provide a complete picture. William G Smith is described as a photographic artist in the 1856 street directory, but his name does not appear as a photographer in the 'professions and trades' directory. William Lane, an important name in the early history of photography in Brighton, is not listed in Folthorp's Directory of 1856, yet newspaper advertisements from this time show that William Lane was employing two other operators, Mr Davis and Mr Warner, and in addition to his main studio at 213 Western Road, Lane had a branch studio in Shoreham. Portrait of a Boy (c1855). "Verreotype" portrait taken at Lane's Photographic Gallery, 213 Western Road. William Lane called his collodion positives "verreotypes". In America they were known as "ambrotypes". By the time Folthorp's Directory of 1856 was published, the daguerreotype was on its way out. All the photographers listed in the Professional and Trades section of Folthorp's Directory appear under the heading Photographic and Talbotype Galleries. 'Farmer's Daguerreotype Rooms' had become 'Farmer's Photographic Institution' and William Lane had abandoned the daguerreotype for his Verreotype process. In an advertisement dated 3 January 1856, William Lane promoted his new and improved Verreotype Process, by detailing the advantages the new process had over the daguerreotype. Verreotypes, Lane proclaimed, were perfectly free from metallic reflection and could be seen "in every shade of light." Verreotype portraits took only a short time to produce and could be "taken in dull, or even rainy weather . . . when it would be quite impossible to operate with the Daguerreotype method." Lane states confidently in his advertisement that "these never fading Portraits . . . are now superseding Daguerreotypes." In 1838, the English scientist and inventor Sir Charles Wheatstone (1802-1875) had described the phenomena of binocular vision and designed apparatus which fused two separate drawings into a single three dimensional image. To describe this viewing instrument, Wheatstone coined the term "Stereoscope" (from the Greek words 'stereos' meaning "solid" and 'skopein' meaning "to look at") With the advent of photography, Wheatstone's reflecting stereoscope, which utilised mirrors, could be used to view a pair of almost identical photographs and give the illusion of depth. Sir David Brewster (1781-1868), a Scottish physicist, designed a stereoscope that employed two lenses which mimicked binocular vision. Jules Duboscq (1817-1886) a Parisian optician constructed an improved stereoscope based on Brewster's design, which merged two photographs of the same subject to form a three-dimensional picture. At the Great Exhibition of 1851, Queen Victoria was particularly impressed by Duboscq's stereoscope and the accompanying stereoscopic photographs. Queen Victoria's interest in the stereoscope signalled the start of a popular demand for stereoscope viewers and stereoscopic photographs. In 1856, Brewster reported over half a million of his stereoscopes had been sold. 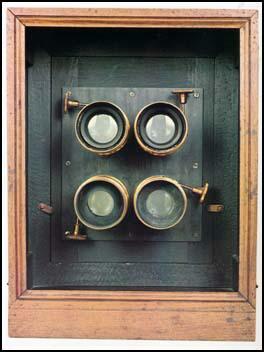 A few stereoscopic talbotypes had been made for Wheatstone soon after the introduction of photography in 1839. In the early 1850s, however, most of the early stereoscopic photographs were daguerreotypes. Duboscq had displayed a set of his own stereoscopic daguerreotypes at the Great Exhibition of 1851. In 1853, Antoine Claudet patented a folding stereoscope which could view stereo daguerreotypes. A couple of years after the Great Exhibition of 1851 stereoscopic photography arrived in Brighton. In 1853, Thomas Rowley, Optician to the Sussex and Brighton Eye Infirmary, was advertising his "superior selection of stereoscopes with Daguerreotype plates, Collodion and Photographic Pictures" which could be hired from his premises at 12 St James Street. In November 1853, Robert Farmer of the Daguerreotype Rooms, 59 North Street was offering to provide a "stereoscopic Portrait, with Stereoscope, 10s 6d, complete." 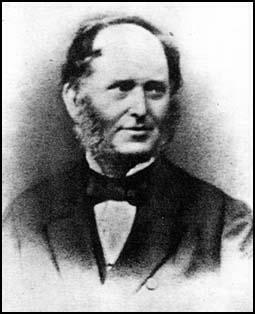 Lewis Dixey, Optician and Dealer in Photographic Apparatus, announced in 1854 that he could supply "Stereoscopes & Stereoscopic subjects in Calotype, Daguerreotype & Collodion or Glass." George Ruff of 45 Queens Road, Brighton specialised in stereoscopic portraits in colour. The reflective surface of a silvered copper plate was not ideal for stereoscopic effects and the process did not lend itself to the manufacture of large quantities of stereo pictures. With the advent of the collodion glass negative and photographic prints on albumenized paper in the mid 1850s, the mass production of stereo cards became possible. In 1857, The Brighton Stereoscopic Company based at 121 St James Street, near the Old Steine was selling stereoscopes from half a crown (2s 6d/121/2 p) and stereoscopic views were on sale at a shilling (1s/10 p) each. 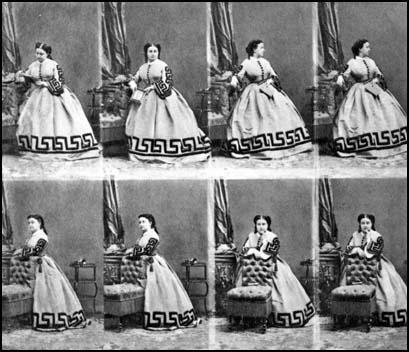 The fashion for collecting and viewing stereoscopic photographs reached its peak in the early 1860s. In 1862 alone, The London Stereoscopic Company had sold a milliion stereoscopic views. A wide variety of stereoscopic images could be purchased - views of faraway places, (Japan, The Andes) scenes of everyday life, anecdotal pictures, humorous tableaux scenes, 'still life' arrangements and pictures of life in town and country.In 1858, Samuel Fry, a photographic artist based at 79 Kings Road, Brighton,even produced a "Stereograph of the Moon"
Some of the stereoscopic views sold in Brighton were of purely local interest. William Mason junior, the son of W.H.Mason, printseller and proprietor of the Repository of Arts in Brighton's Kings Road, photographed scenes featuring local craftspeople, such as basketmakers, and issued them as stereographic cards. More typically, the Brighton artist Edward Fox, who specialised in landscape photography, advertised "local views as stereoscopic slides." Familiar landmarks in Brighton, such as the Royal Chain Pier and the Royal Pavilion became popular subjects for stereo cards.Some of Edward Fox junior's stereoscopic slides featured particularly dramatic scenes. Fox's titles included " The Chain Pier During a Gale " and " Chain Pier by Moonlight". Albumen is a clear,organic material found in its purest form in the white of an egg. Smooth, transparent and sticky, albumen was seen as a suitable binder in photography. In 1847, the French army officer and chemist Abel Niepce de Saint-Victor (1805-1870),coated glass plates with egg-white mixed with potassium iodide and then sensitized the dried plates in a bath of silver nitrate. The albumen-coated glass plates made fine, photographic negatives, but exposure times ranged from five to fifteen minutes and so were only really suitable for photographing landscapes or buildings. Albumen glass negatives were soon superseded by Fred Scott Archer's collodion glass negatives. In 1850, L. D. Blanquart-Evrard (1802-1872), a French photographer, introduced albumenized paper for photographic prints. Albumen from the white of an egg was mixed with sodium chloride. Sheets of thin paper were coated with the albumen mixture and then sensitized with silver nitrate. A collodion glass negative could produce finely detailed photographs on albumenized paper. By the 1860s, most photographers were using collodion glass negatives and albumenized paper in the production of photographic prints. Blanquart-Evrard exhibited his albumen prints at the Great Exhibition of 1851, announcing that his new process made it "possible to produce two or three hundred prints from the same negative the same day." The albumen print became an essential component for the mass production of photographic images and played an important part in meeting the public demand for stereographic cards and carte de visite portraits in the 1860s. When Joseph Nicephore Niepce created the earliest surviving photograph in 1826, the materials he used were so insensitive it took 8 hours of sunlight for the image to be fixed on the pewter plate he had prepared. Niepce's heliograph ('sun drawing') was a view of his courtyard, taken from a top floor window. In 1839, when photography was first introduced to the world, camera exposure times ranged from five to fifteen minutes and so the only suitable subjects were buildings, landscapes and arrangements of still life. The majority of the pictures made by L.J.M.Daguerre himself are of buildings and views in Paris. Artists and amateurs may have been content to use the new invention to produce a pleasing landscape or record an interesting building, but astute businessmen knew that financial reward and commercial success would lie in portrait photography. Every effort had been made to reduce camera exposure times so that the daguerreotype process could be used to make portraits. By the early 1840s technical advances in photography meant that a sitter would only have to hold a pose for a number of seconds rather than a number of minutes. When Richard Beard, the patentee of the daguerreotype process in England and Wales, sold licences authorising the setting up of 'Photographic Institutions' in provincial towns, the purchasers were mainly interested in using the invention to "take likenesses." 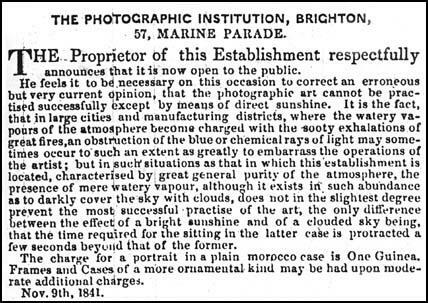 The journalist who in November 1841 welcomed the opening of William Constable's 'Photographic Institution' on Marine Parade in the pages of the Brighton Guardian, recognised that the main purpose of photography was to secure "a correct likeness without the tedium of sitting for hours to an artist." William Constable made his living from taking "likenesses", charging his customers one guinea for "a portrait in a plain morocco case", but it is known that he occasionally took his camera on to the streets of Brighton. In the 1840s, Constable took views of fashionable houses in Kemp Town, and two daguerreotypes of houses in Lewes Crescent ended up in the photograph collection of Richard Dykes Alexander. In the early 1850s, local artists Edward Fox junior and George Ruff senior were taking photographs of buildings in Brighton. Ruff made a daguerreotype of St Nicholas Church around 1850 and Edward Fox, who declared in later advertisements that he had "given his whole attention to Out-Door Photography since 1851", produced pictures of shop fronts, churches and other public buildings in Brighton and the surrounding area. In 1853, Robert Farmer, proprietor of the 'Daguerreotype Rooms' in North Street, Brighton was exhibiting his calotype views of the Royal Pavilion and the Railway Terminus and daguerreotype views of Brighton's oldest church. With the advent of the collodion process, more and more photographers in Brighton were taking their cameras out on the street to record life in the town. Old buildings and structures scheduled for demolition were a favourite subject for photographers, who were anxious to record them for posterity. For example, a battery of eight guns was established in Brighton's West Cliff in the 1790s to protect the town from French attacks by sea. 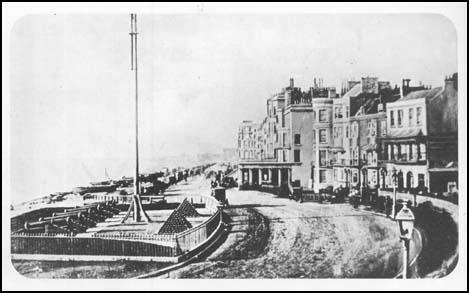 In 1857, it was decided to remove the West Battery so that Brighton's main thoroughfare, the King's Road, could be widened. Work commenced in January 1858 and from this date a series of photographs recorded the progress of the dismantling of the battery and the breaking up of the artillery ground. In 1862, a row of old houses and shops that ran from 41 to 43 North Street, was scheduled for demolition. A set of oval shaped photographs recorded the shop fronts and the rear ends of the buildings that were to be demolished. It is not clear exactly why these photographs were commissioned, but they allow us to glimpse not only a vanished parade of Victorian shops, but also a few bystanders, some of whom would not have been able to afford the services of a photographer. 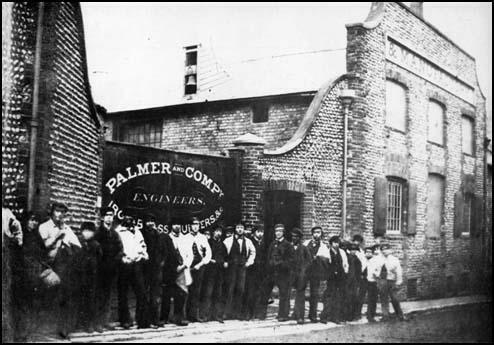 Another gorup of workers whose wages probably would not stretch to pay for a sitting at the professional portrait studio, are captured on a photograph showing the entrance ot the premises of Palmer and Company, Engineers and Iron Founders. In the early 1850s, a number of French photographers put forward the idea of mounting a small photographic portrait on a card the same size as the customary calling card. In 1854, a Parisian photographer called Andre Adolphe Disderi (1819-1889) devised a multi-lens camera with a collodion plate that could be moved to capture between four and twelve small portraits on a single glass negative. This meant that a photographer equipped with a camera with four lenses could take a total of eight portraits, in a variety of poses, all on one camera plate. From the resulting negative, the photographer could produce a set of contact prints on albumenized paper, which could then be cut up and pasted on to small cards. The card mounts were the same size as conventional visiting cards (roughly 21/2 inches by 41/4 inches or 6.3 cm by 10.5 cm) and so this new format of photograph came to be known as 'carte de visite' - the French term for visiting card. In 1857, Marion and Co, a French firm of photographic dealers and publishers, introduced the carte de visite (cdv) format to England. By 1859, the carte de visite portrait was fashionable in Paris, but the new format was not immediately popular in this country. In May 1860, John Jabez Edwin Mayall, who was later to open a photographic studio in Brighton, made a number of portraits of the Royal Family. Mayall was given permission to publish the portraits of the Royal Family as a set of cartes-de-visite. In August 1860, the cartes were released in the form of a Royal Album, comprising of 14 small portraits of Queen Victoria, Prince Albert and their children. The Royal Album was an immediate success, and the cartes sold in their hundreds of thousands. 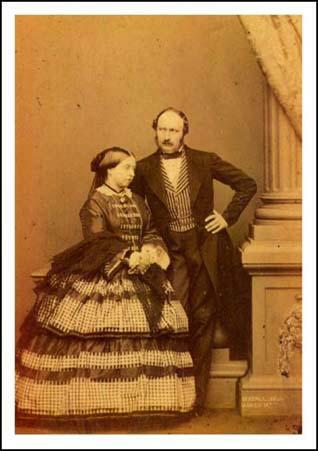 LEFT:Queen Victoria and Prince Albert by J J E Mayall (1861) One of the royal portraits that was issued as a cdv. The publication of a set of royal portraits started a fashion in Britain for collecting carte de visite portraits of famous people. Another series of royal portraits by Mayall was published in 1861. In the December of that year, Queen Victoria's husband Prince Albert succumbed to typhoid fever and his death created an enormous demand for his portrait. The Photographic News later reported that within one week of his death "no less than 70,000 of his carte de visite were ordered from Marion & Co." By the end of the decade, Marion & Co, had paid Mayall £35,000 for his portraits of the Royal Family. Leading photographers made portraits of the famous personalities of the day, which were then issued in carte de visite (cdv) format and sold through retail outlets such as print sellers, stationers, booksellers and fancy goods shop. The retail trade dealt with cdv portraits of statesmen, politicians, actors, authors, artists, entertainers and other famous people. By 1861, Thomas Hill, who sold all manner of fancy goods at his shop at 66 East Street, Brighton, was selling 'Albums for the Carte de Visite' and had in stock a "great variety" of these celebrity portraits. In the early 1860s, Brighton studios were advertising cartes de visite of local celebrities. William Hall, a former partner in the photographic firm of Grey & Hall and now the sole proprietor of the studio at 13 St James Street, was one of the first photographers in Brighton to promote celebrity cartes. In a newspaper advertisement dated 27th February 1862, Hall offered to the public cdv portraits of "Eminent Ministers - taken from life." Hall listed 20 church ministers who were featured in his cdv portraits, including the Reverend T. Trocke of Chapel Royal and Reverend J.L.Knowles of St Peter's Church. In September 1862, the photographic firm Merrick & Co of 33 Western Road, was offering for sale, at 1s 6d a copy, a cdv portrait of 'The African Princess' who had married Mr.James Davis at Brighton the previous month. In the 1860s, every High Street photographer in Brighton recognised the fact that the carte de visite (cdv) was the most popular of the portrait formats. The cdv also generated the most income. It is reported that J J E Mayall produced over half a million cartes a year, which helped him secure an annual income of £12,000. In December 1861, The Photographic News declared "At the present time, we believe cartes de visite are the most renumerative class of portraits produced by professional photographers." The Photographic News pointed out that the cdv's profitability stemmed from the fact they were "generally ordered in quanitities." The cdv itself became an advertisement and generated business. As The Photographic News explained: "each one sent out is a recommendation and almost certainly brings fresh customers. Thus a sitter orders a dozen copies; in giving these to his friends, he places each one, to a certain extent under the obligation of giving a portrait in return; and thus it happens that every portrait taken becomes, as it were, the nucleus of a fresh order." With the growing popularity of the cdv portrait, High Street photographers experienced an increased demand for their services. A top London studio could expect, on average, around 30 sitters a day, although in the summer months the figure could be higher. In May 1861, Camille Silvy's London studio recorded 806 customers for that month alone. A provincial photographer reported that "fifteen in a morning was considered a good day's work, although in the summer it often rose to twenty-five." Benjamin Botham arrived in Brighton to set up a photographic portrait studio around 1861. When he decided to sell his studio seven years later in order to begin a new career as the proprietor of the Oxford Theatre of Varieties, he passed on nearly 10,000 negatives to his successor. The demand for carte de visite portraits led to a further growth in the number of portrait studios in Brighton.In 1858, there were around 16 photographic studios in Brighton. By 1862, when the carte de visite craze was taking off, the number of portrait studios in Brighton had risen to 21. Lane's Photographic Portrait Rooms at 213 Western Road became the photographic studio of The Carte de Visite Co., with William Lane acting as manager. At the height of the cdv craze in 1867, there was a total of 37 studios in Brighton, most of which were supplying cdv portraits. The 1860s saw the arrival of large London firms intent on establishing branch studios in Brighton. Dickinson Brothers was a leading firm of printers and publishers based at 114 New Bond Street. The company had achieved national recognition for a set of 55 large, coloured lithographs, entitled 'Comprehensive Pictures of the Great Exhibition of 1851', which illustrated the various display areas at the Crystal Palace. By 1855, Dickinson Brothers had become interested in photography and had established two photographic portrait studios in London, one at their premises in New Bond Street and the other at 174 Regent Street. Dickinson Brothers established a branch studio at the prime site of 70-71 Kings Road, Brighton around 1862. Lowes and Gilbert Dickinson carried on their photographic portrait business in Brighton until 1868, when the demand for carte de visite portraits had begun to decline. Around 1862 the London firm of Dickinson Brothers established a photographic studio at 70 Kings Road, Brighton. By 1867, Dickinson Brothers had moved their photographic portrait studio to 107 Kings Road, Brighton, next door to Hennah & Kent at No 108, and Lock & Whitfield at 109 Kings Road. 1864 saw the arrival of two companies which had already established a reputation for high class portrait photography in London's fashionable Regent Street - J J E Mayall and Lock & Whitfield. Lancashire born John Jabez Edwin Mayall (1813-1901) the son of a manufacturing Chemist and Dye Works proprietor, had begun his working life near Huddersfield, West Yorkshire, but around 1842, he travelled to America to study the art and science of photography under the tutelage of two scientists attached to the University of Pennsylvania. In 1844, Mayall entered into partnership with Samuel Van Loan and together they operated a daguerreotype portrait studio in Philadelphia. A few years later, Mayall returned to England and by April 1847 he had established a Daguerreotype Institution at 433, West Strand, London. By 1852, Mayall had opened a second studio at 224 Regent Street in the West End of London. Mayall had secured the patronage of Queen Victoria and the Royal Family and between 1860 and 1862, he published sets of royal portraits in the carte de visite format, which triggered a craze for collecting cdv portraits. Mayall achieved fame and fortune. In the year 1861, he reportedly made £12,000 from his carte de visite portraits. Leaving his eldest son Edwin to run his London studios, John J.E.Mayall moved down to Brighton with his wife and two younger sons and on 18th July 1864, he opened his new photographic portrait studio at 90-91 Kings Road, close to the recently built Grand Hotel. In an announcement placed in the pages of the Brighton Examiner, Mayall declared that he had "spared neither pains nor expertise in preparing, for the accommodation of the nobility and gentry resident at or visiting Brighton, one of the most efficient studios ever built." Although he addressed his comments particularly to the "nobililty and gentry", Mayall admitted that he was "not unmindful of the fact . . . that moderate charges are as necessary as general excellence to ensure extensive public patronage." Mayall charged £1.1s (£1.05p) for a set of 12 carte de visite portraits and £5.5s (£5.25p) for his "highly finished" coloured portrait photographs. More modest establishments in Brighton were offering a dozen carte de visite portraits for 5 shillings (25 p.) in 1864. Mayall made the guarantee that his new Brighton studio would be "as successful in operation as it is complete in design". Mayall's name remained on the Kings Road Studio until 1908, seven years after his death. Mayall, who lived in the Brighton area until he died in Southwick on 6th March 1901, involved himself fully in the life of the town and became active in local politics and in 1877 he was made Mayor of Brighton. 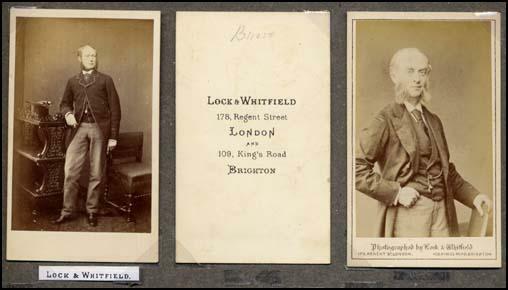 Lock & Whitfield, Photographers and Miniature Painters of 178 Regent Street, London established a branch studio at 109 Kings Road, Brighton in 1864, a few months after Mayall opened his studio on the same fashionable highway. Samuel Robert Lock (1822-1881) was an artist who in the early 1850s was converting talbotype portraits into painted miniatures. In September 1856, he joined forces with George C.Whitfield (born c.1833) who had recently built a photographic portrait studio in London's Regent Street. In an advertisement placed in a Brighton newspaper, dated 20th September 1864, Lock & Whitfield offered to take "carte de visite and every description of photograph, colored or uncolored (sic), on paper, ivory or porcelain." Lock & Whitfield probably employed a manager to run their Brighton studio in the 1860s, but by the time of the 1871 Census, George C Whitfield was living at Upper Rock Gardens, Brighton with his wife and five children. Samuel Lock took up residence in Brighton in 1877, but died 4 years later on 9th May 1881. Lock & Whitfield's Brighton studio at 109 Kings Road was taken over by another chain of photographers, Debenham & Co in 1886. Carte de visite portraits taken in Brighton by the London firm of Lock & Whitfield. After they established a studio in Brighton at 109 Kings Road in 1864, the partners continued to operate a portrait studio in London at 178 Regent Street.The studio in Regent Street carried the name of Lock & Whitfield until around 1895. In 1866, Frederick Richard Window, a London photographer who had introduced the Diamond Cameo Carte de Visite two years earlier, put forward the idea of a larger format for portrait photography. The proposed format was a photographic print mounted on a sturdy card measuring 41/4 inches by 61/2 inches. (roughly 11cm x 17cm). The new format was called the Cabinet Portrait, presumably because a large photograph on a stout card could be displayed on a wooden cabinet or similar piece of furniture. The Scottish photographer George Washington Wilson (1823-1893) had produced 'cabinet' sized landscape views as early as 1862, but F.R.Window had adopted the large format specifically for portraiture. Window believed the larger dimensions of the 'cabinet print' (4 inches by 51/2 inches or approximately 10.2 cm x 10.2 cm x 14.1 cm) would enable the professional photographer to demonstraste his technical and artistic skill and produce portraits of a higher quality than the small cdv would allow. The cabinet photograph increased in popularity as the demand for carte de visite portraits fell. Much larger than the cdv, the size of the cabinet format made it more suitable for group and family portraits. The collodion wet plate process produced excellent results,but had major drawbacks. The photographer had to coat the glass plate evenly with the sticky collodion solution immediately before use and each stage of the process - sensitizing, exposing and developing - had to be done while the plate was still wet. "Wet plate" photography was difficult enough in the studio and darkroom but outdoor photography was particularly troublesome. A photographer who wanted to operate away from his studio would have to carry with him a large amount of heavy equipment, including glass plates, a tripod, bottles of chemicals and some sort of portable darkroom, as well as the bulky camera itself. Attempts were made in the 1860s to produce 'dry plates' for photography. Glass plates were either coated with alternate layers of albumen and collodion or an emulsion of silver bromide in collodion. The "wet plate" process had to be carried out in the 10 to 20 minutes it took for the collodion to dry.In contrast, these pre-coated 'dry plates' could be stored, used in the camera when required and processed when convenient. However, these early "dry plates", were not very light sensitive and required exposure times of up to fifteen minutes. The search continued for a substance that could bind light sensitive materials to the glass plates, but allowed fast exposure times. In 1871, Richard Leach Maddox (1816-1902) a doctor with a strong interest in photography, proposed the employment of gelatin, the transparent substance which is used to make jellies. Dr Maddox's idea was taken up by other experimenters, including Charles Bennett, who discovered that prolonged heating of the gelatin-silver bromide emulsion would increase its sensitivity to light. Applying this method, Bennett was able to produce dry plates with exposure times of a fraction of a second. [ABOVE] Photography outside of the studio before the introduction of photographic "dry plates". 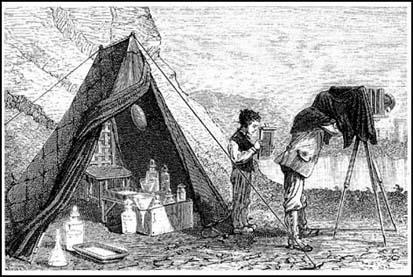 This engraving, which dates from the 1870s, shows the photographer with his camera on a tripod, his young assistant holding the "wet collodion plate" in a slide frame, and behind him a darkroom tent containing a chest of chemicals and other photographic materials. All this equipment had to be transported to the location by a photographer using the "wet collodion " process. 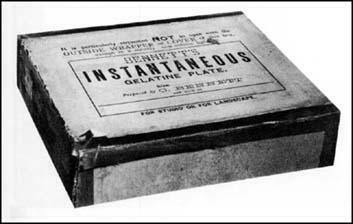 [ABOVE] A pack of Bennett's Instantaneous Gelatine Photographic Plates. These "dry plates" were manufactured by Charles Bennett,who perfected the "dry plate" process in the late 1870s. By the end of the decade 'gelatine dry plates' were being manufactured on a large scale. Samuel Fry, a professional photographer who had been active in Brighton between 1858 and 1860, established a factory to produce 'ready made' dry plates in the late 1870s. By 1879, there were more than 14 firms manufacturing "dry plates". Manufactured gelatin dry plates were evenly coated by machine and were consistent in quality and could be stored for weeks or months before exposure and development. In the 1860s, Edward Fox junior, Brighton's leading landscape photographer, was offering to take "Instantaneous Portraits of Animals, Groups etc." in Brighton and the surrounding area. We do not have details of the special apparatus or techniques that Fox employed to take instantaneous photographs in the 1860s, but it was not until the introduction of the highly sensitive gelatin dry plates in the late 1870s, that other Brighton photographers started to use the term "instantaneous". The greater sensitivity of manufactured dry plates reduced the length of exposure times to a fraction fof a second,. Although the use of gelatin-bromide dry plates did not have a great impact on the work of the photographer producing single portraits in the studio, it did enable professional photographers to extend their photographic repertoire. To hold a pose for a number of seconds proved difficult for restless and fidgety children and uncomfortable for elderly or disabled sitters. In 1879, Henry Spink, who had a studio in Western Road, Brighton and another at Goldstone Villas in Cliftonville, was advertising "an instantaneous process for invalids and children. Satisfaction guaranteed. First rate photographs taken in any weather at any hour of the day." In 1864, when carte de visite portraits were the norm, a set of 12 cdv portraits of a single figure would cost £1. 1s (£1.05p) at Mayall's new photographic portrait studio in Brighton's Kings Road. J J E Mayall charged extra for more than one sitter. A cdv portrait of a couple would be priced at £1.11s 6d (£1.571/2p) for a set of 12, while a dozen copies of a portrait of three people would cost £2.2s (£2.10p). In 1878, the firm of C Hawkins of Preston Street, Brighton were offering to photograph large groups on "moderate terms". An advertisement for Hawkins' studio in January 1881, when the larger cabinet format and instantaneous photography were making family portraits more popular, does not mention additional charges for groups of sitters.A cabinet size portrait of a family would cost 2s 6d (12 1/2 p ) at Hawkins' studio in 1881. When Louis Jacques-Mande Daguerre made his daguerreotype of the Boulevard du Temple in 1838, the exposure time was so long (probably between 10 and 20 minutes) he was unable to capture the hurrying figures and the moving traffic in this busy Paris Street. Only a man who had to remain still while his shoes were polished by a boot-black, was completely captured on Daguerre's silvered copper plate. Although, as a contemporary noted at the time, the boulevard in question was "constantly filled with a moving throng of pedestrians and carriages", the street in Daguerre's early photograph appeared to be completely deserted "except for an individual who was having his boots brushed." In fact, the shoeshine man himself must also be included as one of the first human figures to be depicted in photography. But as a German magazine of 1839 observed, the man "having his boots polished . . . must have held himself extrenely still for he can be very clearly seen, in contrast the shoeshine man, whose ceaseless movement causes him to appear completely blurred and imprecise." By the 1860s, photographic exposure times had been reduced to a few seconds, but this still meant that a person who moved suddenly while the photograph was being taken would become blurred and indistinct and a figure who passed rapidly in front of the camera would become almost invisible, leaving only a feint ghostly shape on the negative. Specially prepared gelatin dry plates were so sensitive that out of doors and in bright sunlight exposure times could be as brief as one twenty fifth of a second. Dry plate photography encouraged the professional photographer to leave his studio and journey to the homes of his customers. No longer weighed down by heavy wooden chests filled with bottled chemicals nor encumbered by a darkroom tent, professional photographers were ready to travel longer distances in order to secure commissions. 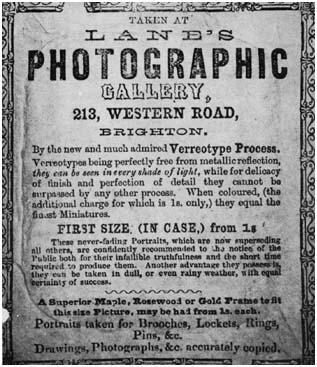 Early in 1881, Messrs Lombardi & Co a firm of photographers with a town studio at 113 Kings Road, Brighton placed advertisements in the local press "to inform the Gentry and Clergy of Sussex that they are now prepared to Visit the different Estates in this and other Counties to Photograph Buildings, Horses, Groups etc. etc . . Schools attended either in town or country." As early as 1867, Messrs W. & A.H. Fry artists & photographers of 68 East Street, Brighton had specialised in taking photographs of groups out-of-doors. An advertisement in the Brighton Guardian of 14th August 1867 announced they had "Special Apparatus for taking Out Door Pictures of School Groups, Cricket Elevens, Croquet Parties, Archery Meetings, Rifle Corps and Country Seats." Having already established a reputation for outdoor group photography, Walter Fry and his younger brother, Allen Hastings Fry, were keen to take advantage of the mobility afforded by dry plate photography. In an article published in 'The Professional Photographer' in June 1916, Allen Hastings Fry looked back over his long photographic career. The magazine observed that Mr Fry appeared to be "a portait photographer glad to get away from the confinement of his studio." In the interview, A.H.Fry revealed that he had "photographed two hundred Public School Cadet and Officers' Training Corps", adding the observation that he had "travelled over 9,000 miles during the year I was taking the photographs."